Here’s one of the few articles that I can find that references the accidental shooting and death of Levi Lightcap. Of course, there’s a few errors. The article appeared on page 1 of the Wisconsin State Journal on 13 Dec 1870. FYI, the shooting actually took place in North Judson, Starke County, Indiana. 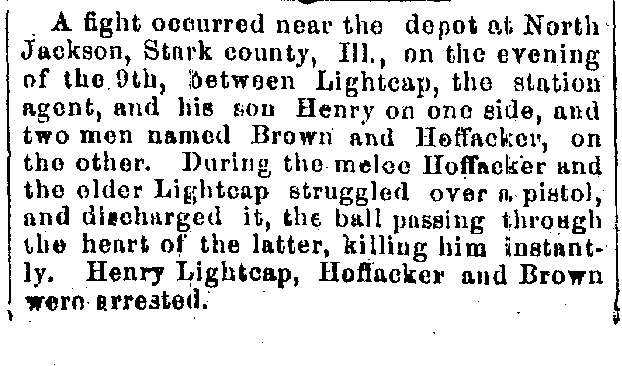 A fight occurred near the depot at North Jackson, Stark county, Ill., on the evening of the 9th, between Lightcap, the station agent, and his son Henry on one side, and two men named Brown and Hoffacker, on the other. During the melee Hoffacker and the older Lightcap struggled over a pistol, and discharged it, the ball passing through the heart of the latter, killing him instantly. Henry Lightcap, Hoffacker and Brown were arrested.